Ironically, the US EPA’s Comprehensive Five-Year Plan did not include Ms Begay’s backyard, until she traveled with this film to Washington, DC and screened it on Capitol Hill in September, 2008. Together we are building a groundswell for environmental justice. Join Groundswell and Navajo Communities in this mission. We will continue filming and raising awareness until all Navajo communities impacted by more than one thousand abandoned uranium mines are cleaned up. The film chronicles an extraordinary chain of events, beginning with the appearance of a 1950s film reel, which lead to the return of a long lost brother to his Navajo family. Living for more than six decades in Monument Valley (on the Arizona/Utah border), the Cly family has an extraordinary history in pictures. Since the1930’s, family members have appeared as unidentified subjects in countless photographs and films shot in Monument Valley including various postcards, Hollywood Westerns and a rare home-movie by legendary director John Ford. But it is the sudden appearance of a rarely seen vintage film that affects their lives the most. In 1997 a white man identifying himself as Bill Kennedy from Chicago showed up in Monument Valley with a silent film called “Navajo Boy” which he says his late father produced in the 1950s. Seeking to understand his father’s work on the Navajo Reservation, Kennedy returns the film to the people in it. When Cly family matriarch, Elsie Mae Cly Begay, watches the film she is amused to see herself as a young girl and delights in identifying other members of her family. Elsie recognizes her late mother in the old film as well as her infant brother, John Wayne Cly, who was adopted by white missionaries in the 1950s and never heard from again. With the return of “Navajo Boy,” Elsie seizes the opportunity to tell her family’s story for the first time, offering a unique perspective to the history of the American west. Using a variety of still photos and moving images from the 40s and 50s and telling their family story in their own voices, the Clys shed light on the Native side of picture making and uranium mining in Monument Valley. When the long lost brother, John Wayne Cly, learns about the return of “Navajo Boy” in a New Mexico newspaper, he contacts the Clys in hopes that they are his family. 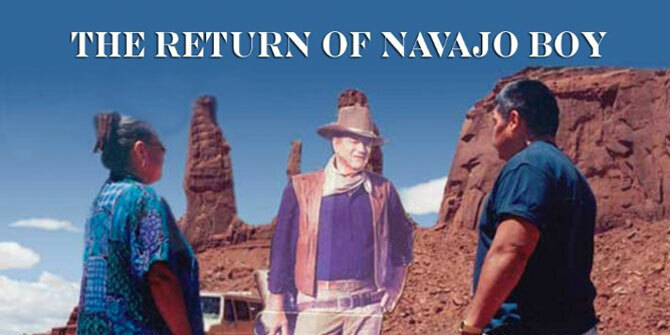 As he tells his side of the story The Return of Navajo Boy takes on a literal tone, setting in motion John Wayne’s unforgettable return to his blood brothers and sisters in an emotional reunion in Monument Valley. This unique Sundance Film Festival 2000 selection weaves together all the different threads of the Cly family story, narrated by Elsie’s son Lorenzo Begay. Through this inside narrative of the Cly’s inspirational saga, The Return of Navajo Boy gives new meaning to old pictures and performs a healing miracle of its own. Order the film on DVD today.